If you weren’t doing comedy, what would you want to do? Hello Jerry, then again since we’re not friends (yet) I’ll call you Mr. Seinfeld. When you were a kid, what was your ultimate “one day if I’m rich I will…” fantasy? Did you fulfill it yet? I don’t have one. I do have a long driveway in my house in Long Island, and sometimes I ride on it on a scooter. And that makes me feel like Richie Rich. 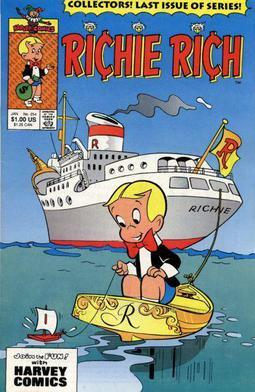 Richie Rich, that comic book, made me anxious. Just the whole thing was kind of weird, it brought out strange, uncomfortable emotions of envy, and you know, sadness. He had parents, but it was one of the most depraved comic books of all. I wonder if it still exists, it can’t possibly still exist.